Had you stopped by Atlanta’s Trinity Towers on the morning of Nov. 28, you’d have found precious little evidence of what was about to take place. 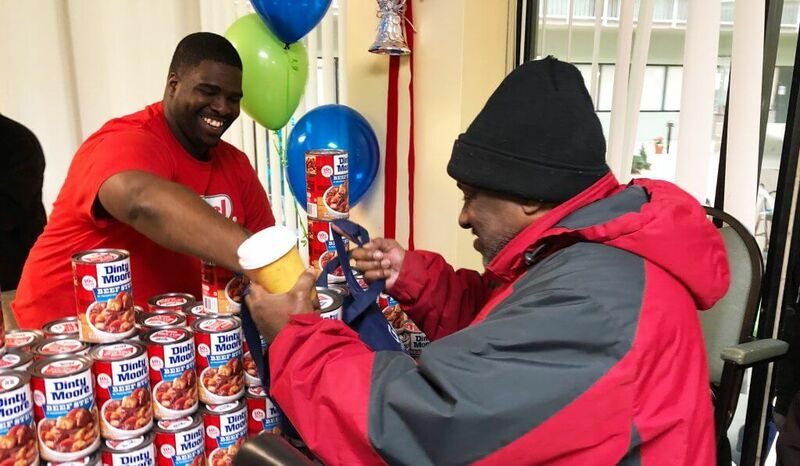 Until noon, the senior residence’s activity room and adjoining kitchen were still, awaiting the arrival of a bevy of volunteers from Hormel Foods and Goodr, a brand-new community partner of the Minnesota-based food company. Then the midday magic began to unfold. In came a truckload of food from Kroger and other purveyors, as well as can after can of Dinty Moore® beef stew. Workers began buzzing about, creating a popup grocery store of well-organized (and picture-perfect) presentations of fresh produce, bacon, roasts and other food items. Those in the kitchen went about the task of ladling beef stew into stockpots and slow-cookers, a treat for the seniors, not to mention the reason for the event. 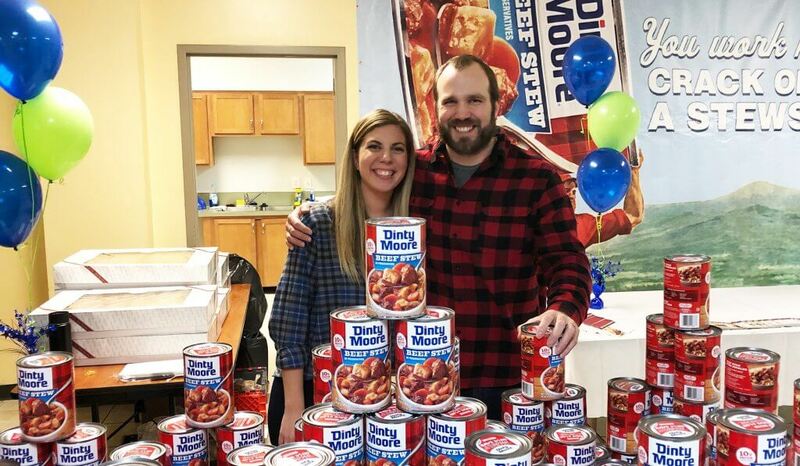 Hormel Foods Brand Manager Sarah Johnson got the ball rolling several months ago. With oversight of the Dinty Moore® brand, she has an appreciation for value consumers, the line’s bread-and-butter demographic. “I knew I wanted to partner with a philanthropic group, to give something back,” she says. The Hormel Foods corporate communications team took Sarah’s request to heart, doing what she calls “all the legwork” to find – and set up a partnership with – Goodr. Honing in on Atlanta made a lot of sense, Sarah says. 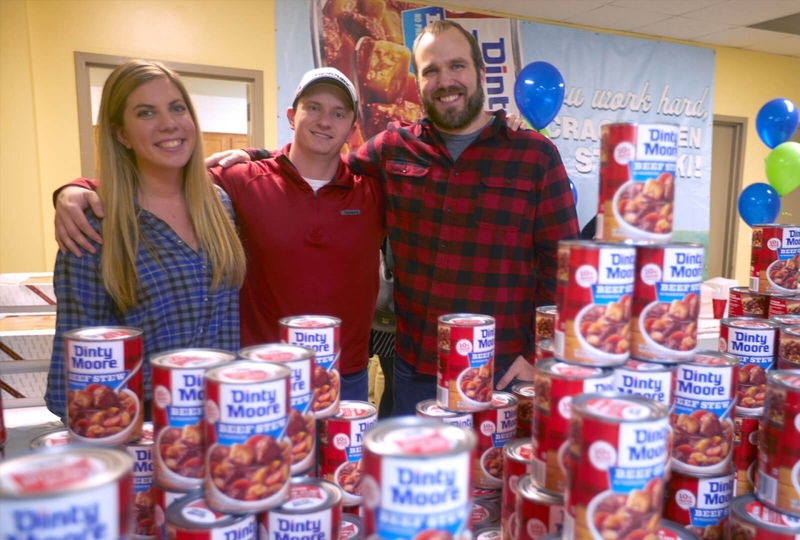 Dinty Moore® products hail from nearby Tucker, Ga.
“As a company, we are committed to giving back to the communities where our employees work and live,” she says. Partnering with Goodr was another thoughtful move. The Atlanta-based nonprofit focuses on reducing food waste and fighting hunger, and it does so with aplomb. 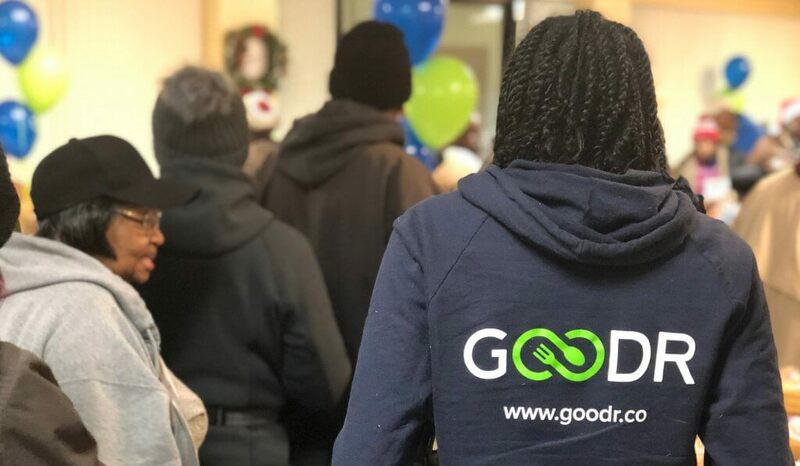 From a technological standpoint, Goodr is knocking it out of the park, using block-chain technology and a proprietary app to take food that’s getting close to being wasted and put it in the hands of people and organizations that mobilize quickly to distribute it to those in need. Its founder and CEO, Jasmine Crowe, was likewise on-site to eagerly pitch in and give hunger a one-two punch. 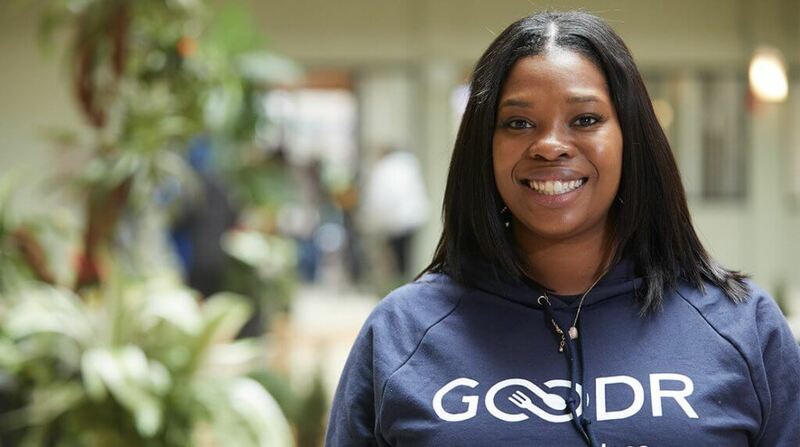 This is the first time Goodr has joined forces with a food company or brand, she says, and it’s something she’s “prayed for.” Plus, she admits to having a soft spot for seniors. “I just think they’re forgotten about,” she says. “That smell, that aroma. It just makes you ready for it,” he says, proclaiming he couldn’t wait to eat his stew. As a matter of fact, he enjoyed it while making his way through the grocery displays, filling his reusable bag with enough food to last him several weeks. The latter point shouldn’t be overlooked, says Felecia Lanier, resident service coordinator at Trinity Towers. 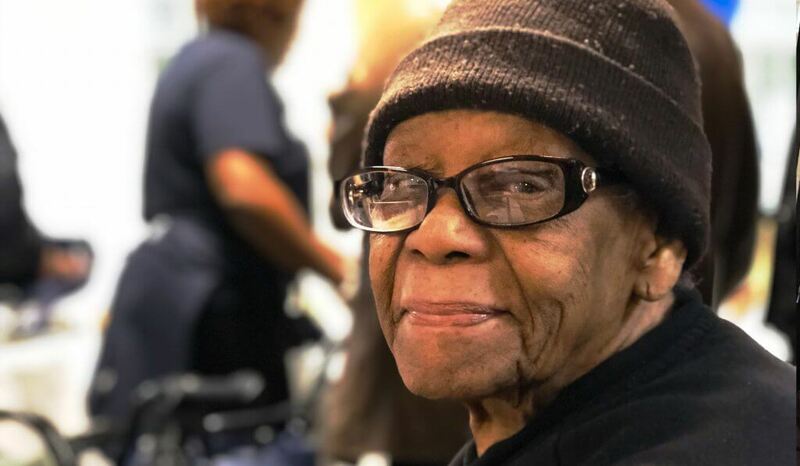 She describes her role as one of helping “residents age in place” by acting as the liaison between them and support services of various kinds. She’s painfully aware of the fact that their food dollars can easily run dry before the month winds down. It’s a chronic problem. “In the second half of the month, some have no food,” she says, adding that in addition to being on small fixed incomes, the residents typically get a mere $15 in monthly food stamps. “They’re … celebrating because they have enough food to last a couple of weeks. That’s the blessing,” she says. What Sarah noticed happens by design. In addition to getting food to hungry people, Jasmine cares about lifting their spirits by fighting the stigma that all too often accompanies poverty. Linens, music and other special touches are among her hallmarks. “It’s critical for us to diminish the shame people have when they don’t have enough food,” she says, relaying a bit of the story that marked a jumping-off point for her. Several years after graduation, her college roommate fell on temporary hard times. She was embarrassed to tell Jasmine she was hungry. She’s back on her feet now, and her fridge is full, Jasmine relates. Anyone can hit a rough patch. 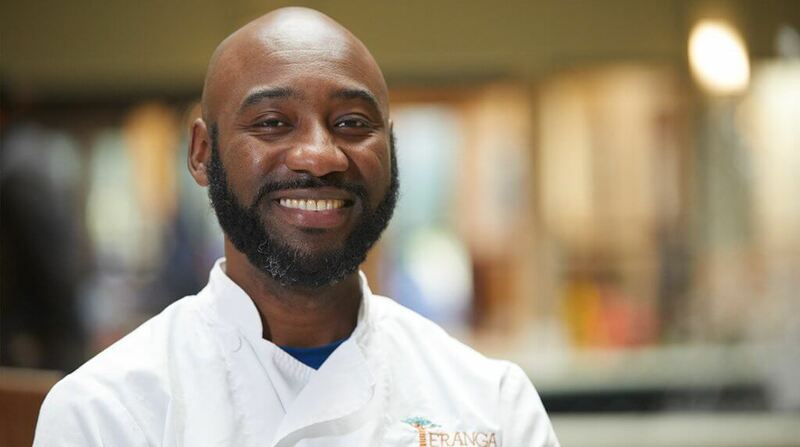 One of the people helping Jasmine combat hunger’s pall is Cheikh Nydaie, a professional chef and caterer, and a familiar face at Goodr events. Several years ago, he answered a call for volunteers to feed homeless people living under an Atlanta bridge. What struck him most was how the event was set up like the restaurant he was working in at the time. He vowed to do more. 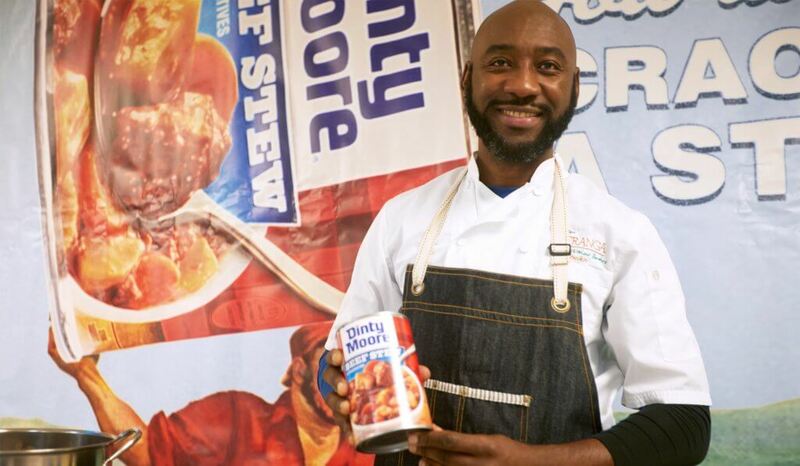 It’s safe to say no one – not the team from Hormel Foods and its Austin, Minn., headquarters, not the workers from the Dinty Moore® beef stew plant in nearby Atlanta, not the staff of Goodr and Trinity Towers – would have argued the point.